The Tiburon Peninsula Foundation is thrilled to support the Tiburon Salmon Institute's annual Salmon Release at Blackie's Pasture. 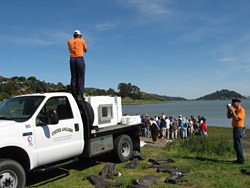 Three thousand juvenile Chinook salmon are released into the wild by children who use buckets to carry fingerling salmon from a truck to the San Francisco Bay at high tide. The salmon are raised by students at Casa Grande High School in Petaluma from eggs found in the Feather River. Working in conjunction with a variety of organizations including the California Department of Fish and Game, the California Academy of Science, the Romberg Center for Environmental Studies, and Trout Unlimited, the Tiburon Salmon Institute is premised on the belief that children have power. By teaching children and giving them hands-on experience, they learn life skills that will help them rebuild dwindling habitat and save the salmon fishery that currently exists. For more information contact Brooke Halsey at Brooke@tiburonsalmoninstitute.com or at 415-608-6386.